So when I trigger a voice, any voice any chan, a high pitch whistling comes out on top. Sounds like machinery noise. the sound triggers just fine, no other problems with the unit. Absolutely nothing else in my rack has this noise. after adding up everything in there. Cannot seem to filter it out. Also tried simply turning down all the oscs... no help at all. turned off all the effects. Again no help at all. Any ideas? That sounds strange? Just to narrow things down, does this high pitched whine also happen when you trigger it with midi? I just ran some tests. Firstly I put the synthbox in a case with ONLY the eloquencer. it is running a MN PSU/board that has 1100ma available on it. so *shouldn't* be the psu. Although, I have a brand new Intellijel PSU coming in today so... i'll get to test that out today too. Here is when it happens. It ONLY happens when the gate is held high to trigger the sound. If the gate is fast, the little whine is fast. If I hold the gate high the whine continues until I let go. I though it was maybe some modulation setting i didn't know, but after testing all of the presets, they ALL do this. Gate high = little whine on top of everything. I've noticed that immediately when I let go the whine goes away, and the "tail end" of the sound during release of the envelope is totally crystal clear, no whine. We are aware of an issue where some hardware sending gate signals into the bitbox or synthbox causes this problem (low level noise on the audio outputs). As a workaround, if you lower the incoming voltage of the gates with a buffer or repeater this typically avoids the problem. We recommend using a +5V signal for the gate for best results. As Dan suggests, using MIDI will also avoid this problem. Let us know if that does not help. Okay that makes a lot of sense for what I just figured out today. I'm pretty confident it is not my power supply because I put in the intellijel power supply and it's the same thing. It's exactly what you described however also if I send any CV that is higher than the 5 volts it does the same noise. It's not just the gate signals its any CV including volt octave. Basically I need to attenuate my gate signal down and then never go past C5 on my sequencer. Or maybe it's at C6 where it starts ringing. The weird thing is I can send it 10 volts from my modcan quad LFO and it doesn't ring. I scratched my head on that one because it doesn't make any sense. 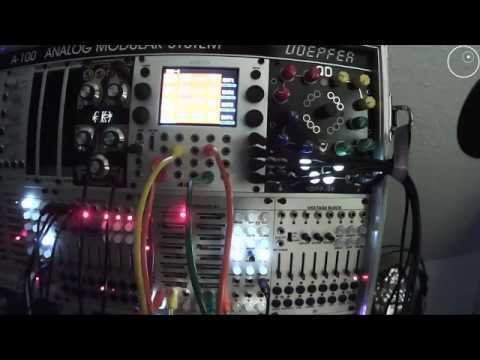 The specific module that is making it ring is the eloquencer from winter modular, but it will not ring from that if I have the gate signals at the right level and the CV signals at the right level. By the way it also wines in the FX box if I send gate or CV to anything in there. And I mean into any of the jacks. If I hit any of the Jacks with anything over 5 volts at Wines. I imagine it's the same on the bit box since it's the same Hardware right? now here's the weirdest thing I found out. Even if I do not plug anything out of the module I can still hear the wine through my output module. So I unplug absolutely everything from the synthbox or the FX box and then I hit the box with the Highgate signal or high CV, and I can still hear the wine even with nothing jacked from the output. It's somehow travels through the power supply over to my output module. Has this last issue been solved please? Do you have a recording of the wine signal produced by the outputs when nothing attached? No. If the input cv is more than 5v it will whine with some modules. I have been attenuating the gates down. Same issues with the Malekko Varigate 8+ and Bitbox V2. deKaro, what exactly do you mean by Bitbox V2? This issue depends on the hardware--not the firmware version. What is the date on the back side of the unit? I got the bitbox 2.0 as an exchange for the bitbox 1.0 (parameter flickering level/pitch & /high pitch noise issue) from my shop. Thanks for the clarification. I just ran a test just like yours and I can confirm that there is gate noise on the generation 2 platform and it is much better than generation 1. To be able to hear it, you need to mute the samples and turn the volume way up. You will hear other, normal background noise from the system as well. In other words, we believe this issue is fixed for normal playback levels where the gate noise will be inaudible. Let me know if you see otherwise.